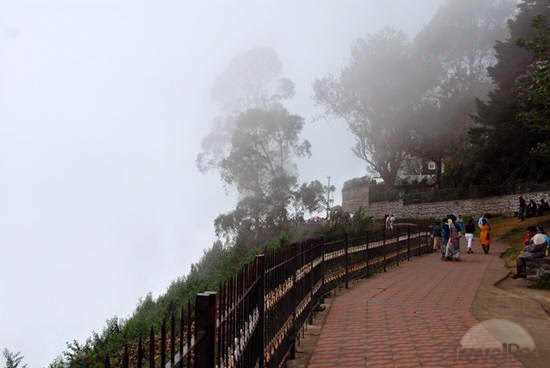 slanted as opaque mist but the reverie of natural forte which can be felt by walking through the gentle steps of historic Coaker’s walk defines the chronology of Lt. Coaker’s who was responsible for tracing the glory of Kodaikanal. The meadows of green and hue of endemic elements that covers the walkway of the Coaker’s walk would definitely take you back to those days when Coaker was preparing the map of Kodaikanal. An essence of European legacy which can be felt while walking the site would lead you straight to its scenic point from where traveler would have an opportunity to view the nestling splendor of nature and geographical landscape. The telescope house which is located within the premises of Coaker’s walk would allow you to see the transparency of township and distant view of the area distinguished its analogy with other tourist destinations that surrounds the site of Kodaikanal. The clad of mountains and haze of blooming rays of sun together creates the new tint of color to fascinate the minds of the traveler and when that murky orange sheds within the slopes and transparency of mountains the vision of seclusion could be realized at the moment. The phenomenon of Brachem Spectre can be witnessed if you are lucky enough the clouds that clears its way by forming a shadow would be accompanied by the glow of sun when the mysticism of rainbow halo would carry your back along with the shades of cloud to form the mist of prevalence. Traveler should come here during the time of afternoon when the density of cloud would submit its annulment to cast the brilliance of nature and one must understand that sessions of afternoon and evening could be busy because of the shops which are placed within the pavements. The souvenir stalls sales sweaters, toys, jackets; furs etc which in turn would give you an opportunity to take one back as a memento of your journey. Season of summer could be consider as a best time to visit the site because during this season traveler would have maximum opportunity to revere the aesthetic approach of the place and make sure to skip the season of monsoon.